For those of you who thought that the 'Black Swan' bandwagon had finally left town, the La Danse lookbook happily proves otherwise. 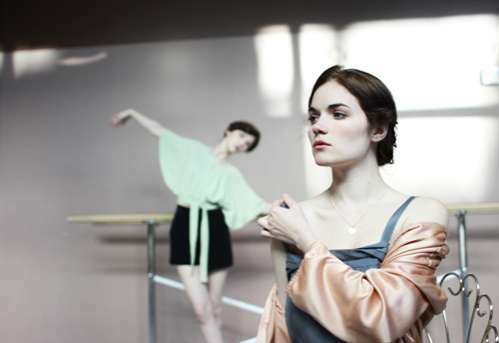 This dance-inspired catalog centers beautifully on two ballerinas who stylishly practice their forms in a minimally designed, softly-lit room. Photographed by Anja Loise Verdugo, the La Danse lookbook showcases fashions from the vintage boutique store Clever Nettle and the online shop Summerland, both of which are based in Portland, Oregon. Simple and elegant, the lookbook beautifully captures the essences of the styles on sale. The La Danse lookbook also featured accessories from Fieldguided, Giant Dwarf and The Vamoose. Models Kiely McDaniel and Meredith Adelaide had their makeup done by Nica Demaria; M. Bardeaux was responsible for the pretty buns and braided hairstyles .